If someone were to purchase me a 25 cent mood ring, the swirl of colors would probably overheat and break the ring. My emotions tend to be off the charts when it comes to my current year of service. I’m constantly in a battle of optimism in wanting to change the world and fighting bitter melancholy against the reality. The pressure nags at my being. As the Ozanam Service Learning Coordinator, it is my job to help inspire the youth to persevere in the darkness. I teach the causes of poverty in a hopeful plea that students will one day provide solutions. Inspiring hope when hope is bleak is quite the task at hand. It has caused me to dig deeper into my faith than I ever imagined. I recognize that the strength and convictions I have are not my own. It is God’s presence that pushes me onward. There have been times where loneliness pervades and all I want to do is quit and live a “normal” life. I find that being informed is so much more depressing than being ignorant of life’s realities. Yet, somehow through conviction or stupidity, I push forward hoping for the best. Hope tends to have such a passive tone to it. We are trained from an early age to try hard and then hope the rest goes well. Yet, it seems that throughout my life, I have tended to only focus on the second part. “Well that exam sucked; I hope I get a passing grade.” “I hope I get off work early today.” “The poverty statistics are terrible; I hope people become more kind.” This constant nonchalant banter becomes worth about as much attention as what the weather might be tomorrow. Hope has become frivolous and yet my life depends on it. Hope is the very reason the Society of St. Vincent de Paul exists. The people we serve at St. Vincent de Paul absolutely need it to get past their troubles. Struggling to make hope real is why I sit in disarray. I fidget trying to look for something tangible to believe in. A good friend/mentor of mine, Fr. Robert “Bud” Grant, once told me that hope is when everything that could go wrong does go wrong; And yet we still believe there is life past it. At first these words seemed strange to me and I did not understand the full weight of what he was saying. Yet as I sit hoping for some tangible form of hope, these words are what I believe it. It is with this definition of hope that I can have confidence in the work I am doing. I might not be changing the world but I still love it for what it is and what it is not. I am unable to help the thousands of individuals and families that depend on St. Vincent de Paul services, but I am able to look past their despair and whole heartedly know that their dignity is not bound by their situations. I compare this experience to sitting on my back porch. Most nights when I look at the sky, all I see are clouds. Yet, I carry with me that the stars still exist. The truth is that God’s light still shines whether I notice it. It is with this light that I press forward to fight for justice. Poverty might always be real but trying my best allows me to not be bound to it. Serving brings me closer to God because I know that God is not outside these terrible situations. This is the significance of the cross. Christ could not escape the reality of dying, and yet he reached life past it. I pray that I can always put my best effort forward. That no matter how bleak a situation seems, the presence is with me and within me to share and recognize. 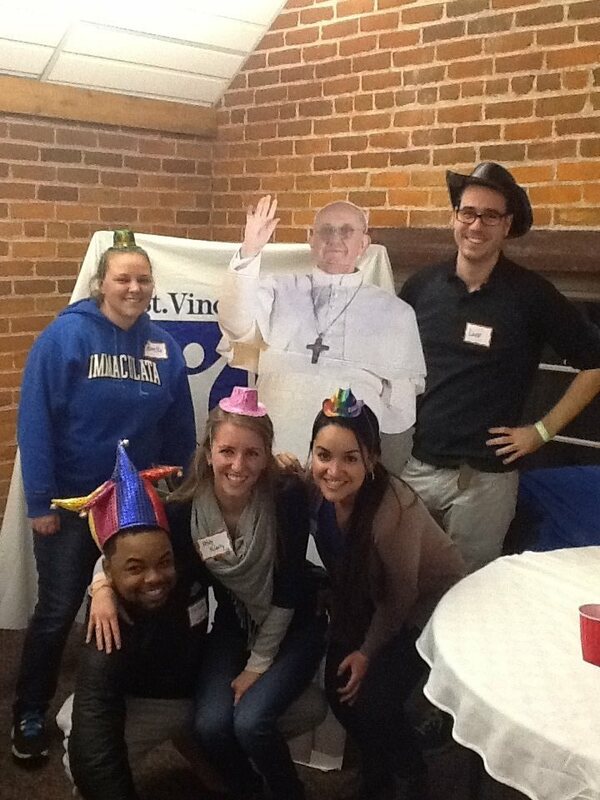 Luke Greene (top right), originally from San Antonio, TX, brings a unique and valued set of gifts to Vincentian Volunteers of Cincinnati this year. He spends part of his week coordinating and facilitating immersion experiences, using this Theology degree, and the other part of his week putting his Industrial Engineering degree to work, helping to make our Thrift Stores more efficient. Luke’s sense of humor and commitment to building community serve as an anchor for the Vincentian Volunteers.